Should the Bulls Retire Derrick Rose’s #1 Jersey? October 18, 2016 Mike Mike's Pick of the Day, NBA Comments Off on Should the Bulls Retire Derrick Rose’s #1 Jersey? The Chicago Bulls traded Derrick Rose to the New York Knicks this off-season, ending a once promising era in Chicago. On October 17th, the Bulls traded Tony Snell for Michael Carter-Williams to gain some point guard depth. Initial reports indicated that Carter-Williams requested to wear Rose’s former #1 jersey. The Bulls were willing to do that, and numerous people became upset over this. The backlash was enough that Carter-Williams decided to change his mind and wear #7 this season. 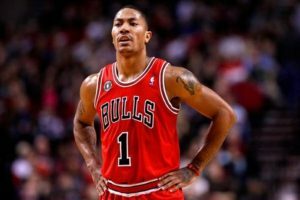 That brings the question – should the Bulls retire Rose’s jersey? Rose was a member of the Bulls for eight years (only playing in seven seasons). He was the Rookie of the Year in 2008-09, selected to three All-Star games, one All-NBA team and in 2010-11 he was selected the youngest MVP in NBA history at only 22 years old. He averaged 19.7 PPG, 6.2 APG, 3.7 RPG and shot 44.8% from the field, 30.2% from three and 81.3% from the free-throw line. He was on five playoff teams, but never made the NBA finals. When you think of retiring a player’s number, you think about the legacy that they left behind. The Bulls have retired four numbers (Jerry Sloan #4, Bob Love #10, Michael Jordan #23 and Scottie Pippen #33). That asks the question – what is Rose’s legacy in Chicago? You could argue that he is more known for his injury history and what could have been than his actual play on the court. He only played in more than 70 games for the Bulls three times in his career (the last was his MVP season). Rose was a terrific player when healthy early in his career, evidenced by his career progression – Rookie of the Year followed by first time All-Star followed by MVP in his first three years. At that progression, he was looking like a lock for the Hall of Fame. Then he missed most of the 2011-12 season due to injuries and in the first game of the playoffs that year, he tore his left ACL – which he would never seemingly fully recover from. He missed the 2012-13 season, returned in 2013-14 only to tear his right meniscus after 10 games. In 2014-15 he returned and tore the medial meniscus in his right knee forcing him to miss another 20 games. Rose was full of promise – he was off to a terrific start to his career, playing for his hometown team, but sadly injuries ruined what could have been. Maybe he can put the injuries behind him with his fresh start in New York, but as far as his time is Chicago is concerned, I would not retire his number and I think the Bulls agree, based on the fact that they were willing to give Carter-Williams his old number. Although, I do think that players will probably avoid his old number, seemingly giving it an unofficial retirement in the short term. Is it really breaking news that Zion Williamson declared for the #NBADraft today? This was just a formality. Copyright 2005-2019. MikesPickz Web Solutions, Inc. All rights reserved.